As one of the finest properties we have ever had in Holiday Rental, this luxury 2 level waterfront home will tick all your boxes for a wonderful Noosa holiday. 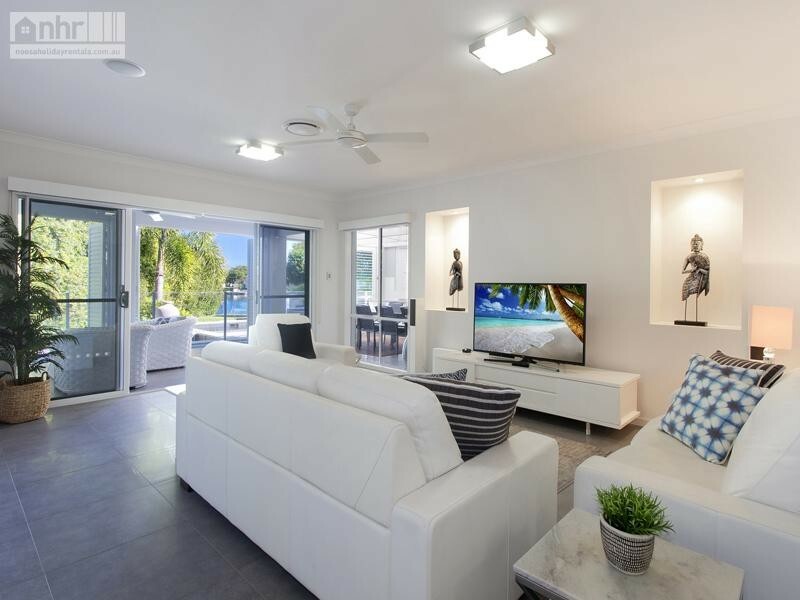 With all 4 bedrooms and a large media room located upstairs, all the day to day living is downstairs, whether you are looking to swim, cook a gourmet meal, surf your emails and Facebook, sun bake or simply kick back and read a book - the choice is yours. Featuring luxury level furniture and furnishings, ducted air conditioning, a pool and spa, and outside undercover dining and entertaining area, you will be able to holiday and feel like a King or Queen at the same time. Located in popular Noosa Waters, this waterfront property is fenced to the water with a shared jetty, with long water views but has a very secluded and private rear outdoor area, including the pool area. And with secure gated entry and 2 car lock up accommodation, holidaying at this amazing property will be a vacation to remember. * Gourmet kitchen with stone bench top, Meile gas cook top, Meile dishwasher and Meile oven and a large fridge with ice and chilled water dispenser PLUS an Aldi Expressi Coffee machine - don't forget to bring your favourite Aldi pods! * Please note that the steam oven, the inbuilt coffee machine, the spa and the inbuilt BBQ are NOT for guest use. Our family of grandparents, children and grandchildren stayed here for 2 weeks over Christmas/ New Year. It was superb. Roomy, pool easily monitored and fishing off the home jettyy a big hit. The kitchen was the best equipped we have ever had. Plenty of cooking and serving equipment and accessories. Agent accessible at all times. One of the best holiday home we have stayed in. We will be back. : It's a very spacious house with a number of living areas and 4 big bedrooms. The house is very clean and the area is quite. I would definitely stay here again.